Prabhulal Murau  was born into a poor farming family in Kapilvastu district, on the border of India. Growing up, he did not have the opportunity to attend school. He started a small business to support his family but he struggled to make the business a success. Eventually he joined an INF Self-Help Group that equipped him with the education and training to empower him to provide for his whole family. This is his story. Living on the Indian border most men in Prabhulal’s community were forced to migrate outside Nepal in search of labouring work because of the lack of opportunity locally. This was not an option for Prabhulal because he was responsible for caring for his elderly parents. He laboured in a nearby brick factory but his wages were always insufficient to provide for the family. 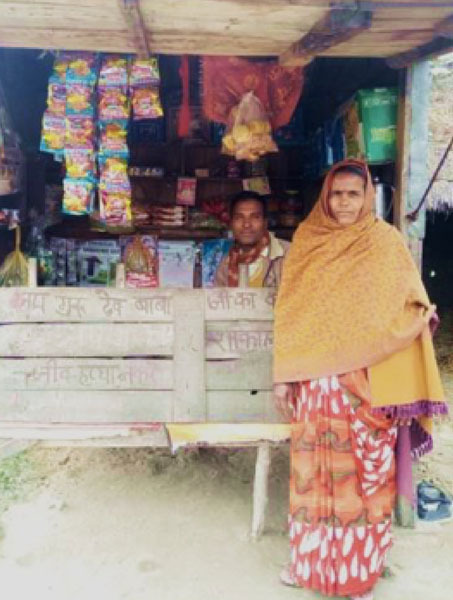 Prabhulal began a small grocery store to try and improve his family’s livelihood. While it started well, it began losing money, and he had to take out a loan. Without education or business training, Prabhulal felt ill-equipped to manage the store. He also felt like he couldn’t share the issues he was facing with anyone. Eventually, in 2013, life began to change for Prabhulal when he joined an INF Self-Help Group. “One day, my business problem was discussed in our group meeting,” says Prabhulal. He took a loan of 13 000 rupees [approx. $150] from the group savings fund they’d been developing and bought new groceries to sell. Following a suggestion from another group member, he also began to collect grains and sell them onto bigger buyers. By sharing challenges and ideas, the group was able to foster unity, trust and help Prabhulal transform his business. As his business began to succeed Prabhulal was able to repay his previous loan and the Self-Help Group loan within a few months. Today his business turns a profit and he can adequately provide for his family. Joining the group brought other life-changing benefits to Prabhulal’s life. INF delivered education and training around women’s empowerment that radically altered Prabhulal’s attitude towards gender equality. Entrenched cultural practices among his people group meant women were prevented from being registered as citizens. This meant they were discriminated against and could not vote, own land and had reduced access to state resources. Through an INF Self-Help Group Prabhulal’s mindset has changed and he has successfully petitioned for his wife to gain citizenship.